I built my first compressor from the guts of a home air conditioner unit( I actually cut open the can and removed the compressor, this was before I found out this was not necessary) but it had no pressure regulation and was far too powerful for my Olympos Iwata HP-C. This was about 1976/7. As a result I couldn’t get the best from my airbrush and always thought it was the brush, as I couldn’t find anything wrong with the air supply. Because it was constant and didn’t appear too excessive. ( remember, I was only 16-17). I later was to sell the brush when I discovered cars as I thought I couldn’t fix its problems. I was able to successfully spray paint many models and paintings with this set up, but the stoppages were too frustrating. After re-discovering models and buying a S/H Badger 200, I needed another compressor as I realised how important regulation of the air supply was. I bought one of these and a friend had a diaphragm compressor that had seen better days, which I also picked up cheap. 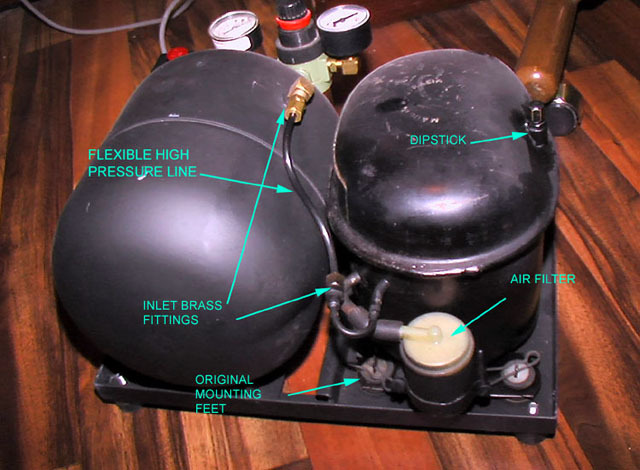 I was aware of the problems with pulsation with this type of compressor so I sourced a S/H air tank from a truck wrecker and with a few fittings, press regulator and some creative metalwork and paint I had a serviceable compressor that served me well for 11 years. Its disadvantages were its size and noise. I found a few used fridge compressors (free, they were at a scrap metal yard) and after testing, selected one that seemed ok. This involved checking compressor operation and especially, pressure. Remember they are being thrown away for a reason. I then sourced a suitable reservoir; in my case it was a Primus gas bottle that was flushed out with compressed air. The fitting was drilled out, being careful not to damage the thread. The pressure relief valve was modified and adjusted to blow off just over the cut off pressure of the pressure switch setting. A frame was welded up from steel and the original compressor mounts from the fridge were incorporated to simplify attachment. The tank had a couple of mounting tabs braised to it and a hole drilled and a fitting braised to it to serve as the input line. 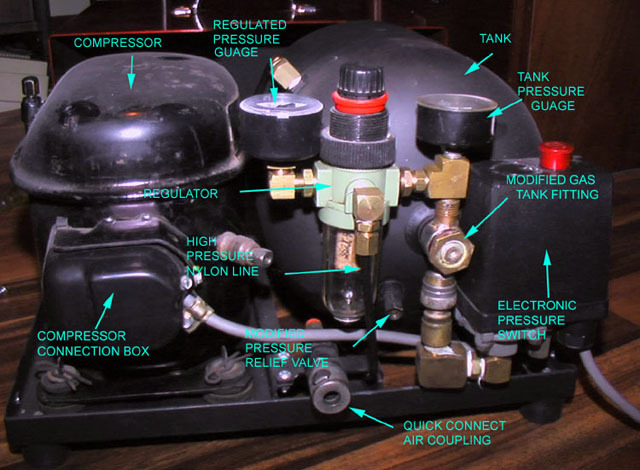 The compressor unit was modified to include a dipstick to check and fill the oil and fittings silver soldered to the output line. An air filter was coupled to the input line from a petrol filter and some rubber hose. 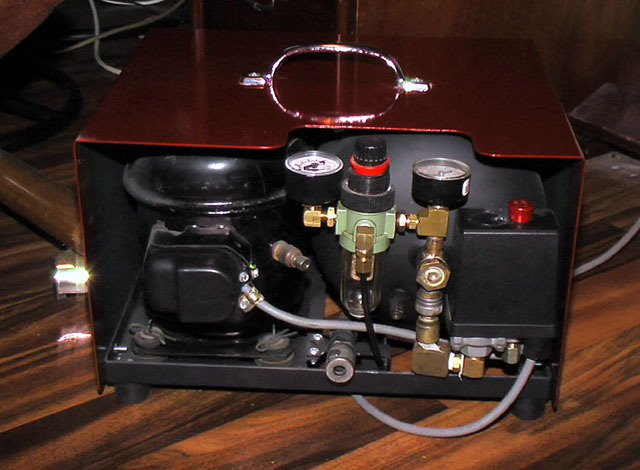 The unit and tank were coupled together using high pressure flexible plastic line and brass fittings made up to adapt the gauges, press switch and outlet fitting to the unit. Finally rubber feet were fitted to the frame and a metal cover bent up and welded at a sheet metal fabricator. This was then given a coat of Candy Apple red (!) (left over from my car building days) and fitted with a handle. It performs perfectly and is very quiet, so now I can airbrush inside at night without waking everyone up. I must point out that building this required quite a bit of engineering and tools/equipment that most people may not have, also familiarity with electronic circuits was also required. I would not recommend this to anyone who is not familiar with the basics of an engineering workshop and circuitry, as the end result may not be safe. Also, be aware that because the compressor unit IS second hand, there is a distinct possibility that it may have to be replaced at some stage, so keep a couple of spare compressor units some where safe, just in case. 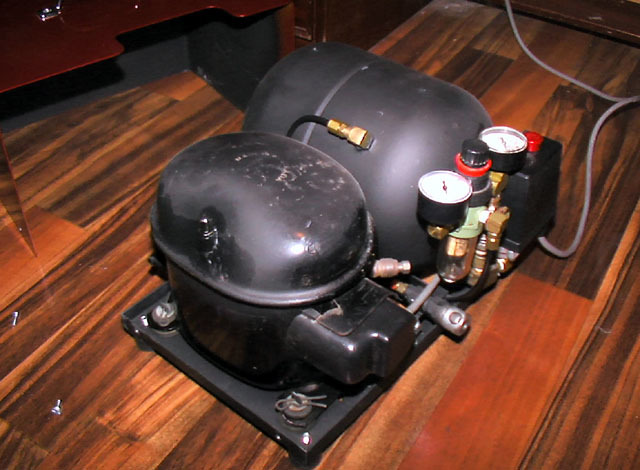 Cost was limited to a pressure switch, two gauges, a regulator with filter, several brass fittings, some flexible high press line, 4 rubber feet, some bolts and nuts, a quick release air coupling , a handle and the metal case.